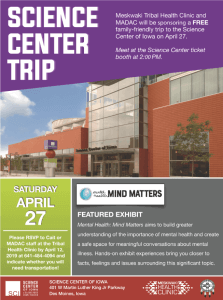 Meskwaki Tribal Health Clinic and MADAC will be sponsoring a FREE family-friendly trip to the Science Center of Iowa on April 27. Featured Exhibit: Mental Health – Mind Matters. Please RSVP to Cait or MADAC staff at the Tribal Health Clinic by April 12 at (641) 484-4094 and indicate whether you will need transportation. 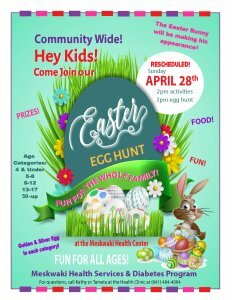 Stop by the Meskwaki Health Clinic on Sunday, April 28th for games and activities at 2 PM followed by our annual Easter egg hunt at 3 PM. There will be a “golden” and “silver” egg in each age category and a visit from the Easter bunny! Prizes, food, and fun awaits! Age categories include: 0-4, 5-8, 9-12, 13-17, and 50-up! Everyone that is going to take part in the Road Side Clean Up will need to get into a group of 5 to 6 people. Each group will then be assigned an area to pick up trash from the road side. The group with the most bags filled up will receive that many in tickets for door prizes. 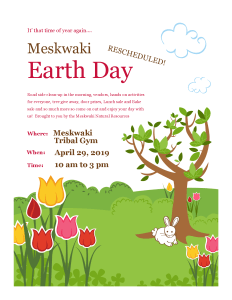 *Tribal Ops Employees – there will be an approved admin leave of 2 hours for everyone in attendance of the days events. Call (641) 484-3511 if you have your team ready to go prior to Monday, April 22nd. 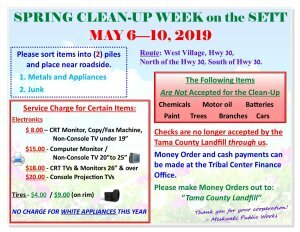 Road side clean-up in the morning, vendors, hands on activities for everyone, tree give away, door prizes, lunch sale and bake sale and so much more! So come on out and enjoy your day with us! 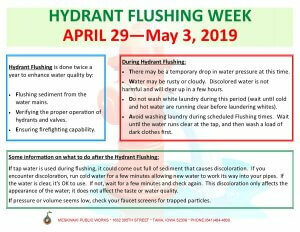 Brought to you by the Meskwaki Natural Resources. 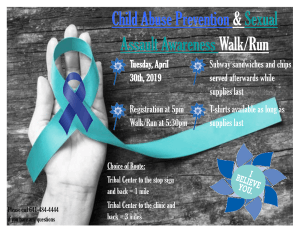 On Tuesday, April 30th there will be a Child Abuse Prevention and Sexual Assault Awareness Walk / Run. Walk / Run begins at 5:30 pm. Please call (641) 484-4444 if you have any questions. 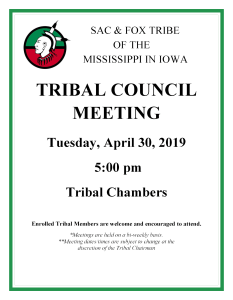 The next Tribal Council meeting has been scheduled for Tuesday, April 30th. It will begin at 5:00 pm and take place inside the Tribal Chambers. 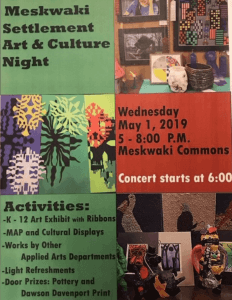 On Wednesday, May 1st from 5:00 to 8:00 pm in the Meskwaki Commons the MSS will be hosting Art & Culture Night. The Concert will start at 6:00 pm. Door Prizes include: Pottery and Dawson Davenport Prints. 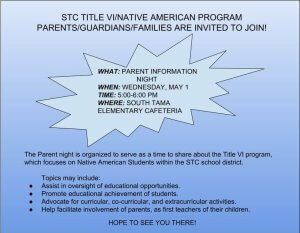 The STC Title VI – Native American Program will be hosting a Parent Information Night on Wednesday, May 1st from 5:00-6:00 pm in the South Tama Elementary Cafeteria. Parents, guardians and families are invited to join! This informational meeting is organized to serve as a time to share about the Title VI program, which focuses on Native American Students within the STC school district. Help facilitate involvement of parents, as first teachers of their children. 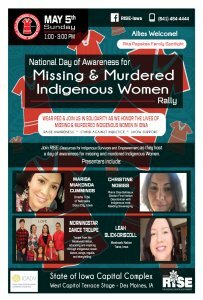 Join RISE (Resources for Indigenous Survivors and Empowerment) as they host a day of awareness for missing and murdered Indigenous Women. On Sunday, May 5th from 1:00 – 3:00 pm at the State of Iowa Capital Complex, West Capital Terrace Stage in Des Moines, Iowa. Wear red and join us in solidarity as we honor the lives of missing and murdered indigenous women in Iowa. Allies Welcome! Christine Nobiss, Plains Cree/Salteaux of the Gordon First Nation and Decolonizer with Indigenous Iowa Seeding Sovereignty. Morningstar Dance Troupe, Troupe from the Meskwaki Nation, educating and inspiring through Indigenous music, dance, songs, regalia and storytelling.